A traditional Polish side dish, very unlike my grandma used to make! The name means “misery” in Polish…perhaps because it is traditionally doused in sour cream, making vegans (and those watching their cholesterol) have to pass. Don’t let the addition of tofu detour you; it delivers the same creamy texture and tang of the original dish. Sprinkle the cucumber with salt. Refrigerator for 1 hour. Mix together the sour “cream”, vinegar, agave nectar. 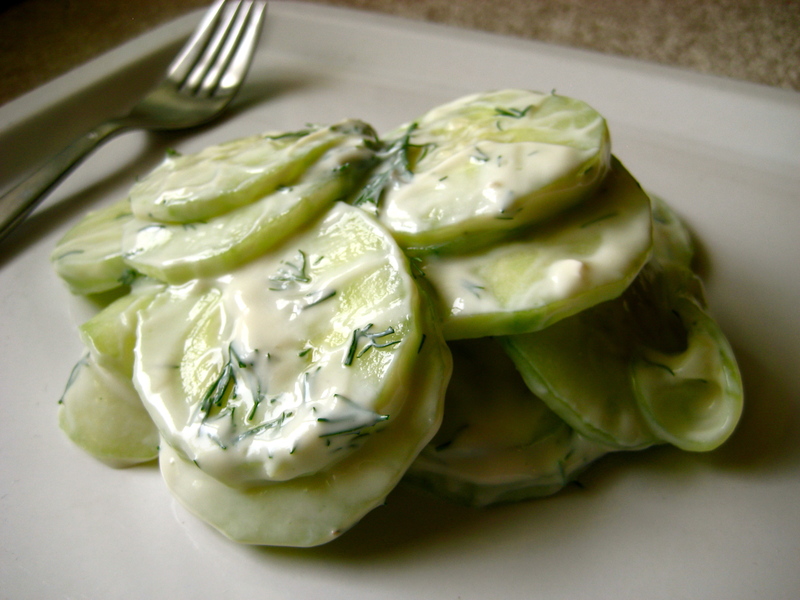 Mix with cucumbers. Stir in fresh dill. Season with pepper. Refrigerate until serving. Put the tofu in a food processor. Add juice from half the lemon, the vinegar, and the salt. Process until smooth, then keep it running while adding the oil through the feed tube. Taste for seasonings, adding lemon and salt if desired. Refrigerate for up to 3 days. I am a big fan of yogurt, but my body isn’t having it lately. This is a nice looking alternative to dairy! I however also try to stay away from soy. I was going to make black radish salad and so bought coconut yogurt and was to mix it with mayo. What would you suggest as a dairy alternative that isn’t soy?